As you may know Alyssa from A Motherhood Experience and I have been on a mission to find the perfect Canadian sponsor to attend Blissdom Canada '11 in October. We planned everything from securing a ticket to booking the hotel. Crunching numbers and making lists. We then went about advertising that we were looking for a sponsor or sponsors. We sent out emails, tweets and even posted on Facebook. This honestly felt like FOREVER even though it only started in March with a let's go to Blissdom Canada comment and we were hooked. I will say when Alyssa and I are on a mission we work hard and never give up! KidZoomer.com- Is a Canadian, Educational resource website geared toward helping Moms, Dad’s, Uncles, Aunts, Grandparents and other caregivers by offering one time promotional prices on KIDS activities, products and services around your city, a Daily deal site. They have had some fantastic past promotions for those from the Toronto area including discounts on personalized stationery, birthday parties, Glam photo shoots, Lego camp and maternity fitness classes just to name a few. We can’t wait until they start releasing some great local promotions for Ottawa too! How does KidZoomer.com work? KidZoomer negotiates amazing promotions on kids products and services. KidZoomer sends all these amazing promotions on kids products and services to KidZoomer.com subscribers. Kids get to enjoy the fantastic KZ promotion in their area! Head on over to www.KidZoomer.com and sign up via email! You will receive the latest KZ promotions right in your inbox! A Motherhood Experience - Alyssa and I are extremely excited to be able to attend Blissdom Canada this year on behalf of KidZoomer. We are looking forward to the next few months working together with our fantastic Official Blissdom Canada ‘11 trip sponsor! Do you use social media like Twitter? 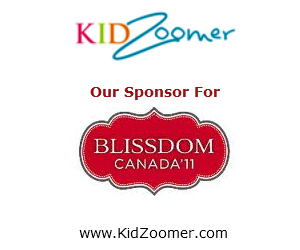 Make sure you are following @CouponMomCanada, @AMotherhoodBlog and our sponsor @KidZoomer while we chat about what KidZoomer has to offer and our preparation for Blissdom Canada ‘11 this fall. Also keep your eye out for upcoming posts and tweets including KidZoomer themed twitter parties in the upcoming months! Thanks to all our loyal Twitter followers, blog subscribers, face book and Google friends connect fans for having faith in us and cheering us on during our search for the perfect sponsor. Thank you so much @KidZoomer for believing in us, we will make you proud!